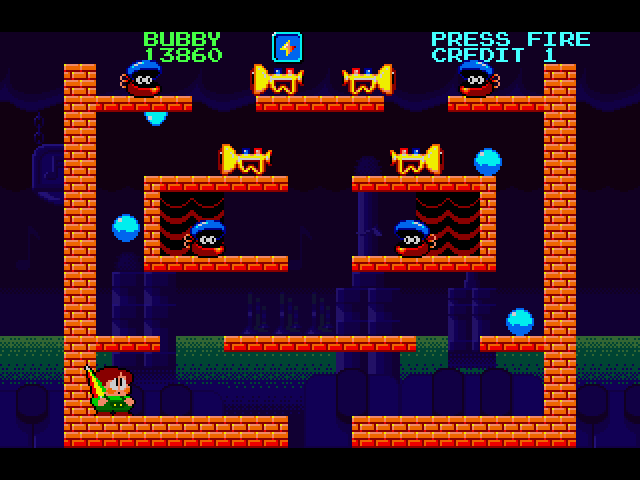 Today we’re going to have a look at a classic 2D platform game developed by Taito. It was released in 1991 by Ocean and was a sequel to the famous Rainbow Islands. The game we’re talking about is Parasol Stars. Taito is a name that many gamers will recognize. Not strange when you think about their releases. Have a look here for a complete list of Taito games. Their gameography is simply stunning! Ever tried The New Zealand Story, Rambo 3 or Bust-a-Move? Those are all Taito games. Even though we’re focusing on the Amiga version in this review, Parasol Stars is available for several consoles. This includes the NES, Sega Mega Drive and PC-Engine. A version for the Atari ST computer was also released. What do you need to run the Amiga version in all its glory? If you’ve got an Amiga 500, just pop the floppy disk into the drive and off you go. Easy as pie. Got an Amiga 1200? Try using the WHD-Load version. WinUAE users can run the game with a normal Amiga 500 Kickstart 1.3 configuration. The game itself can be downloaded from this website. Now, let’s see what Parasol Stars is about and what it has to offer in terms of fun. Most games have a plot or at least pretends to have one. Parasol Stars is no different. Your goal is to save ten planets from an evil wizard. To fullfill this goal, you must destroy his army of dangerous monsters and robots. 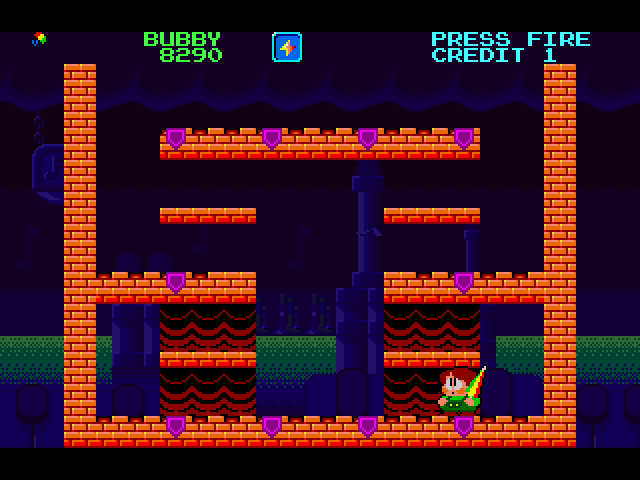 Not exactly the most intriguing scenario, but it works just fine for a platform game of this kind. 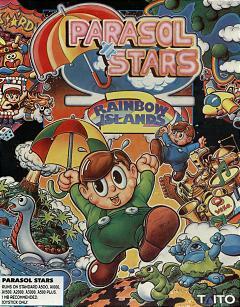 The main characters of Parasol Stars are Bub and Bob. Both armed with devastating magic umbrellas that can make mincemeat out of their foes. The umbrellas can also be used for personal defence and for hurling objects around. If you’ve played a variety of platform games, you’ve probably noticed that some of these games sports vast levels. Good examples are Superfrog and Zool. Things are a bit different in Parasol Stars, as all the action takes place on a single screen. That doesn’t mean that the game is easy, far from it. The screens are often filled with large amounts of horrible monsters and crazy robots that will do whatever it takes to wipe you out. Getting into Parasol Stars is a piece of cake (completing the game in full is a different matter though..), so learning the controls and the most basic moves doesn’t take much time. You can play in either one or two-player mode. I prefer the last one, as blasting through the levels with a companion is a bit more fun. Both characters will be on the screen simultaneously in two-player mode, which is a big plus for Parasol Stars. Remember Rainbow Islands? In that game you had to take turns if you selected two-player mode. Not good enough compared to Parasol Stars. Each level is filled with a wide variety of bonuses. These can be picked up to increase your score, grant you an extra life, or perhaps be of help annihilating your opponents. If you manage to figure out the way these bonuses works and how you can get the best ones, you’ve come a long way. One negative thing is that it is impossible to save your games. This can be considered a drawback, as you’ll most probably have to play some of the levels over and over again. Let’s have a look at how the game looks and sound. The graphics are nicely drawn. No doubt about that. The game is in 32 colours (if I’m not mistaken) and the pixel artists have done everything they can to get the most out of this. They’ve drawn excellent and funny sprites, created smooth animations and made interesting backgrounds. As for the music, I’ll have to say that it gets repetitive after a while. The tune itself is not bad in small portions, but you’ll grow tired of it after an hour. The sound effects are excellent though. Works fine with what’s happening on the screen. Parasol Stars is a fun platform game that is easy to learn, but still provides you with a tough challenge. It sports good graphics and sound effects, but lacks a bit in the music department. The two-player mode is a big bonus and increases the lifespan of the game. The vast variety of enemies, levels and not least bonuses makes it a blast. You’ll come back for more. So, all in all, I’d like to recommend this awesome platform game to retro (and non-retro) gamers out there. Have fun! PS: Have you tried Parasol Stars before? What do you think of this game? I can’t remember I ever played it. It makes me think of Rodland. It was good, but not a patch on Rainbow Islands.